My little blog is suffering from a lack of post. Somebody just told me the other day that he was going to stop checking every day if I didn’t post something new. So to save me from losing a reader, here we go. By the way, if you don’t want to keep checking every day, just sign up on the blog itself to receive an e-mail. The blog entry will be sent to you via e-mail every time I post. Easy, huh? I had a conversation the other day with someone about the difference between what young kids are expected or not expected to do here in the U.S. as opposed to other cultures. It started me thinking. I had dinner with a family recently. There were three generations there — parents, son and wife, and grandson. The grandson was in his early teens but I was impressed with how he sat by the table with us and carried on a normal conversation about soccer, life in school and many other subjects. Only later I noticed that I had just witnessed something unique — kids here are not expected to spend much time in the company of adults who visit your home. Actually, kids are generally segregated from adults even in other settings. In church they normally have their own services. In social gatherings the hosts provide a table for the “young folks.” Even in malls, young people walk together, children have their play areas and adults run around trying to catch up with their kids. This conversation led me to think about the things I did as a child that most of the kids in the U.S. would never be required to do. At 8 years of age I would walk to the market with my mom for about half an hour one-way and help her carry groceries back home. Since the age of 4 or 5 I learned to fold and put away my own clothe. When I was 9 I started working selling sweets on the streets. At the age of 10 I was working at a grocery store and when I was about 11 I was on the back of a truck lifting and loading big sacs of sugar and rice. I became the president of the junior department at church when I was about 12-13 and at 15 I preached my first sermon. I babysat all my younger siblings since I was about 8 and was sent with my sister on mission to get a midwife to attend to my mom when she was in labor pains to deliver one of my siblings at home — a mission we failed miserably at but that is a story for another day. I also remember serving as a sort of taxi driver to younger ladies in my neighborhood who were a bit older than me, taking them to work or school on a bicycle. I must have been about 12 then. Even as a young teen, if my parents needed to go somewhere, they had no qualms leaving our younger siblings for me and my sister to look after. We were 9 so this was a lot of responsibility and thought nothing of it. Today this would probably be considered some kind of abuse, at least in the U.S.
And that’s why I laughed hysterically (at least inside) when I was in Cambodia once with a guy who had retired from working with livestock in an academic setting in the U.S. Traveling in the countryside one day, he noticed a girl who couldn’t be more than 6 or 7 guiding a cow with a simple stick, a not too uncommon scene in Cambodia. He said he would love to meet the parents of that little girl and warn them of the dangers of having a girl her age around large animals like that. I wanted to say something like, “Dude, these people having been doing this for hundreds, maybe even thousands of years, and you think you are going to teach them something new about children and livestock now?” But I kept my mouth shut. Putting kids in an adult world and expecting them to do “big” things when they are still young, within reason, will help them grow stronger. It will give them confidence and it will result in their becoming much better citizens, able to adjust to any set of circumstances and face any challenge thrown their way. At least that’s what I think it did to me. How about you? Do you have memories of doing things that only adults would do today? Do share! very good, Brianna. Good to know at least one person gets it… :). So happy for u and your family! One could argue that what keeps the world moving are the stories of people. When I travel overseas my ears are always attuned to hear stories. I know that most of the times these stories will touch the depths of my heart. They make me cry and laugh, but mostly, they make me walk away at awe of people who have to endure so much for so long with so little in return. 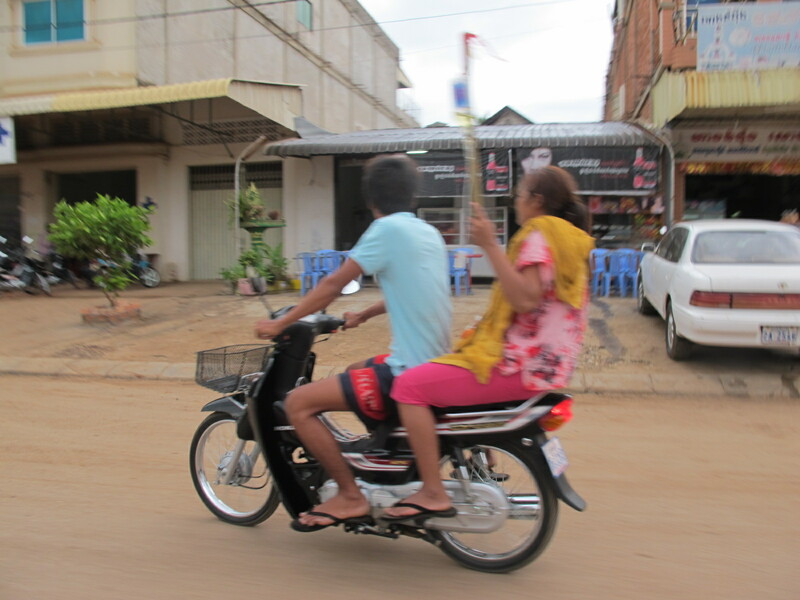 Traveling through the roads in Cambodia, especially between two big cities, one cannot miss a most unusual sign – women riding on the back of motorbikes, holding an IV tied to a makeshift pole, their one arm is outstretched in a most uncomfortable position, the other arm holds an infant, usually wrapped in a soft blanket (the picture above does not do justice to the shock of the scene, since you cannot see the baby nor the expression of concern on the face of the woman, but I had to quickly snap it from inside the car as we passed by the moped). These women, by any standards, are the heroines of this world. Having no other option but to recourse to the motorcycle ambulance, or the favor of a friend or relative, they brave the dangerous roads of Cambodia with only one goal in mind — to do all they can to get their child well. But children are not the only ones who suffer the consequences of willfully inadequate medical services. I was here only two days and feel like I was here one month, judging by the number of tragic stories I heard. 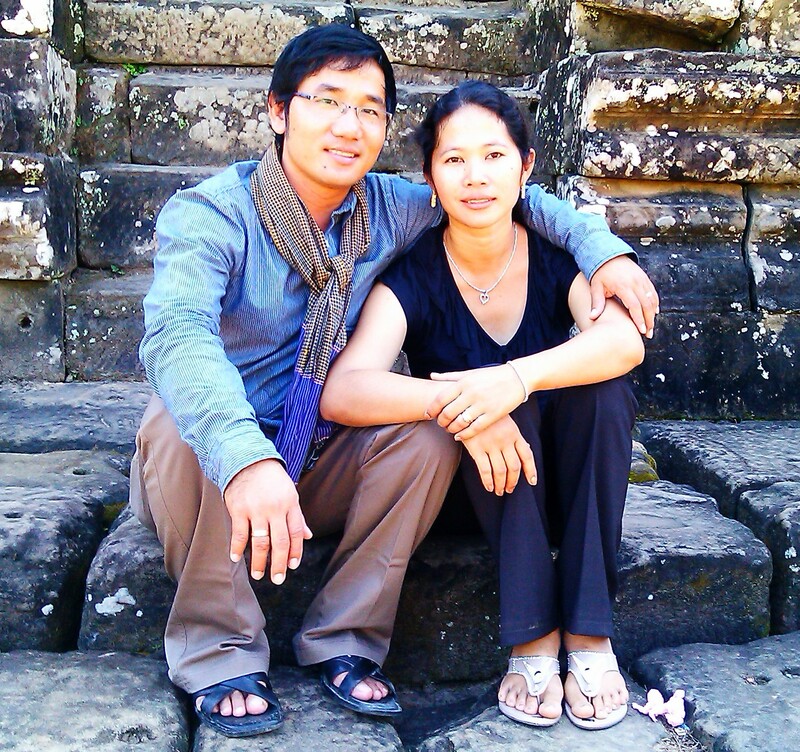 A friend in Siem Reap, whom I have known since 2000, just suffered a terrible loss in her family. Only yesterday the ceremonies for the funeral of her uncle ended. He was 51 and had just bought a field for farming. While preparing his field for planting, he accidentally stepped into a B-40 unexploded device, left over from the time of the Vietnam war. The devastation from the explosion was horrific — he lost his arms, legs and his head was hit hard. He lived four days but could not resist the injuries. The irony is inescapable. Just a few days after Vietnam opened a couple of new fields for Americans to try to find the remains of their brave soldiers who died during that war, an innocent man who was barely out of his teens when the war ended paid the ultimate price for decisions others made and were never held accountable to it. As my friend said, “You hear about people dying from land mine related accidents, but you never dream that it could happen to your family.” There are some wars that never end. Then another friend and co-worker shared about his brother-in-law’s death due to a motorcycle accident. Only in his twenties, already married with three small children, this man was struck by a car while riding his motorcycle — a common occurrence in Cambodia. He sustained multiple injuries to the head but lived for a couple of weeks. During that time, my friend and his wife sold their car, their land, used all their savings and borrowed money from the bank. They took their beloved relative to Vietnam, where health care is more advanced. But after a few days in the hospital, they had to return to Cambodia because they didn’t have enough money to continue the treatment. What is particularly sad about this story is that 10 years ago my friend also lost his younger brother, also in her early 20’s to a similar accident. An American couple who has lived in Cambodia for about 9 years now told me that during that time, they know of at least 25 people — in their circle of friends and acquaintances — who were killed in motorcycle related accidents, mostly young men in their early 20’s. The roads kill in Cambodia with ferocity and no one seems to care. The poor continue to order their rudimentary coffins, if they can afford one, and life goes on. I pick up the newspapers on the planes headed to SE Asia. I am always interested in what the rest of the world consider newsworthy. Looking at the world from other people’s viewpoints is always great. South Korea, for example, is always obsessed with their northern neighbor. One of the stories I read had to do with the North Koreans planting some viruses in some video games inside Seoul Incheon Airport. We in the U.S. perhaps have the luxury of going to bed without ever thinking whether we might be hit with an atomic bomb while we sleep, not so with people who live in South Korea, so they have to be ever so diligent, even with innocent cyber games at their main airport. From Thailand comes a story that is a sign of the times. Over the last two decades the percentage of young people working as farmers, specifically rice farming, has declined steadily. This worries some people because rice is one of the main exports of this country. According to the article, young people prefer moving into the big population centers like Bangkok, and they definitely would rather find a job that keeps them indoors, away from the sun (this is a culture that shuns darkened skin, to judge from all the commercials on T.V. lauding the powers of skin whitening products and all the fair skinned models exhibited on their big billboards), and they will do everything they can to avoid the back breaking job their parents and grandparents had to do to make a living. Plus, in this country, as opposed to Europe and the U.S., for example, farmers are seen as poor, dirty and stupid. Who wants to sign up for that? One thirty eight year old farmer in a small village, the oldest farmer in his entire village, lamented the disinterest on the part of the young people. He said, “It seems like the only thing they can do with their hands is hold a cell phone.” I don’t know why but I find that comment very funny. But there is a business opportunity here too — start opening those carpel tunnel surgery clinics! Video games and cell phones may not kill you, but they might disable you. So I am soon headed to Cambodia to deal with some tough assignments related to our G.R.O.W. home there. If you think of me and are able to pray, I would appreciate it. Perhaps the mechanization of farming will save the jasmine rice of Thailand. And teenagers will once again line up to be high-tech farmers — one hand on the computer and the other on the video games they love so much. My apologies to all of you. I took a brief leave as I was caring for some other important things. But before I get to them, here are the winners of the Brazil quiz. I decided to pick one from each gender, so here they are: Holly Edwards and Paul Cardiff. You know who you are, so send me your address and I will ship you the book, except for Holly, with whom I have made other arrangements. The last few days have been a lot more hectic than usual. First, my wife and my son left for Brazil last Wednesday, leaving me pretty much alone with two dogs. I say “pretty much” because my older daughter is technically still at home, but she works some insane hours in Cleveland and comes home late and briefly. So, for all practical purposes, I was the dog minder for several days. I am proud to say, though, that I walked them twice a day and we had no accident. My wife is in Brazil to care for her mom who is very ill. She got there and was immediately embedded with the “troops” (her two younger sisters) who have been caring for her day and night. We are hoping and praying that she will recover but it will be a long journey. But the good news is that she is very close to my wife and I am certain that my wife’s love, positive energy, and her sheer beautiful presence will sooth her mother’s pain. I know because that is the kind of effect that she had had on me for many years. Then I was getting ready to go across the sea to SE Asia. I leave my house in about two hours, bound for Cambodia and Thailand. As I write, I am also packing. My wife had already packed my big suitcase, now I am caring my backpack and my carry on. My backpack is basic full of gadgets and my carry on has books, snacks, medicines for the G.R.O.W. children and some extra clothes. What am I forgetting? 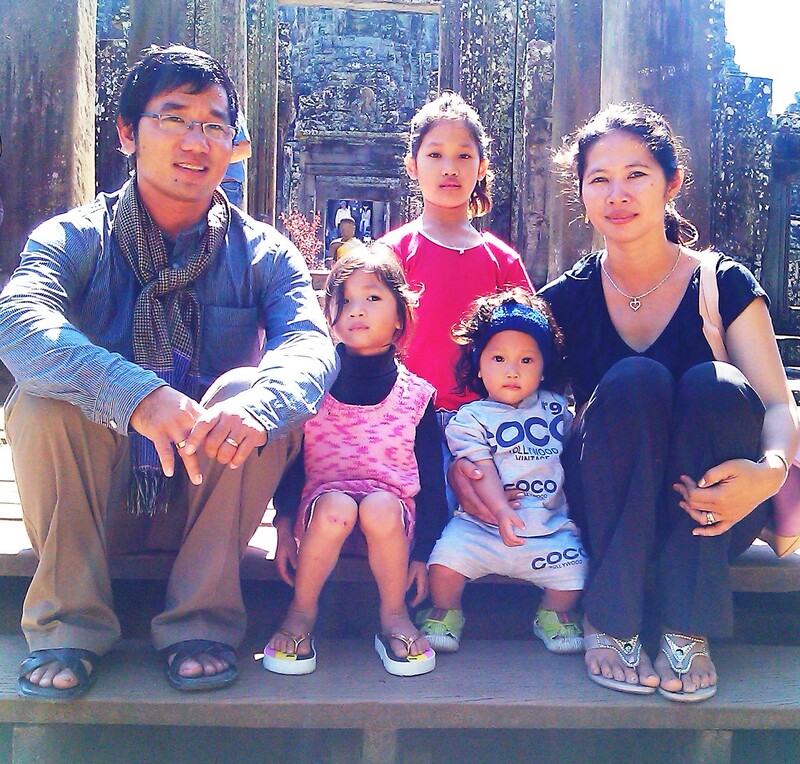 Our church, Wooster Grace, has sponsored a home for orphans in Wiang Pa Pao, northern Thailand. In the beginning we only had about 20 children from about 8 different minority groups (“hill tribes,” as they are referred to in Thailand). Then we grew and now we have 41. There was a house on the property, which the girls currently occupy, but the boys had no permanent home, only a makeshift bamboo structure. Well, in the last four months, through the generosity of our people, we have built a permanent structure for the boys and I will be honored to represent our church at the dedication of the house on June 9th. All of that to say that my blogging may be meager for the next 10 days or so. I will try to post as often as I can, but as I know from many trips in the past, there is never a free moment and the Internet is not always reliable, to say the least. So I thank you for your understanding in advance. I appreciate all of you for taking the time to read my often rambling thoughts here. G.R.O.W. OPENS ITS FIRST HOME IN CAMBODIA! This is a special announcement to all of our friends and supporters: we are opening our first home in Battambang, Cambodia. During my recent trip to Cambodia, Sumitra Faa and I had the opportunity to interview three couples who had shown interest in this position. From the beginning we felt drawn to Sambo and his family. He was amply qualified for the work, and he and his wife were already involved in rescuing children in the city where they lived. We interviewed them twice and presented their names to the board at our recent meeting. We asked the Board to pray and spoke with Sambo during the meeting, at which time we agreed to move the process ahead. By the grace of God, a donor had provided most of the funds to cover the expenses of running the home for the first year. We still have needs that will have to be covered by future contributions, but felt confident to move ahead with this plan. We are operating with a bare-bone budget but trusting God for the future. Before the end of the year, our plan is to see six new girls who have been victims of physical and/or sexual abuse. They will join Sambo’s family and enjoy a new life where they will no longer be in danger and with time will be able to have the hope of glory. While in Battambang, Sumitra and I looked at several houses we intended to rent. Most of the houses were far from what we would consider adequate for the work we do with children. But on our last day there, God allowed us to go to a home we really liked and we found the landlords were very open to our work. They even agreed to reduce the rent significantly and by God’s grace Sambo and his family will be moving to that house on or by February 15th. We couldn’t be more happy with this! Pray for Sambo and Sopha as they meet people and organizations who are already working with children who are suffering abuse. Pray that God will provide the necessary support to keep this home running at the optimum level. As I said above, there will be some extra needs associated with starting this home that are not covered by the budget. If you would like to contribute toward those needs, please send your donation to G.R.O.W. marked “Cambodia, start-up” (P. O. Box 1862. Wooster, OH 44691). All your gifts are tax-deductible. Thank you for your prayers and faithful support or the ministry of G.R.O.W. in SE Asia. We are excited about this new step but also understand that this is a huge step of faith. Please continue to pray that God will move ahead of us and that we will continue to put Him at the center of everything we do. *If you don’t believe in prayer, wish them well! Thank you! I arrived safely in Cambodia yesterday, we hit the ground running today visiting the toul sleng museum (genocide from the khmer rouge) and the killing fields. A day for much reflection on the potential that mankind has to do unthinkable acts of destruction of other human beings. We arrived in Phnom Phen, safe and sound, though a little rugged for wear. Naza is in the hotel room now packing for tomorrow. Internet is available only in the lobby here. We leave by bus tomorrow at 8:45 a.m. to Sihanoukville for two days of R & R before we go to be with the children (and Kevin and Jill Kane) in Battambang. It’s a five hour trip on the bus, so we will need to get some sleep tonight. The trouble is, I am wide awake now and hungry. My meal schedule has been totally messed up now, it’s past 11:00 p.m. here and I am considering stepping into the street to get something to eat. The flight from Soul to Phnom Penh was five and a half hours long. I tried to sleep but kept getting a sore neck by the minute. The Airbus, though, was very nice — new, neat and somewhat roomy. Thank you for prayer for us! “Men shall not live on dreams alone, but without dreams men shall not live.” No one famous ever said that, since I just made that up now. In June of 2008 I stood on top of a mound of dirt with a friend who had a dream to build orphan homes on that very spot in Cambodia. He was only a dreamer then, but he was not the only one. We prayed for a miracle on that corner of God’s earth. After I came home, I resolved to jump into that dream with abandonment. I shared an initial plan with our church board to build an orphan home on that spot, completely funded by our church. This was summer time and we had just approved a new budget. There was no money in it for an orphan home. Oh yes, that was also the calm before the storm — the Autumn of 2008, when the financial world faced a near meltdown. The naysayers came out of the woodwork: “The cost is prohibitive.” Yes, between construction and start-up costs, it was upwards of $60,000. “There are liabilities involved.” Yes, there are always risks involved in this kind of work. “How are we going to find all the sponsors?” 40 children, at the tune of $120 per month. Surely a tall order but not as tall as some had originally imagined. “How’s this going to affect our overall budget?” Well, we didn’t know unless we tried it, but there are enough statements about blessing the fatherless in the Bible, I kept saying. And I don’t believe God is in the business of punishing those who do what He says we must do. One key leader in the church, who was also an important member of the finance committee, raised objections. He was not being a pest, just a consummate bean counter. And I lost count of the times I came home, after a frustrating day trying to answer more questions, and I told my wife, “I quit!”. But as my head hit the pillow, I would think of the faces of the children and they gave me the energy to face another bean-counting day. Today we have two homes, one in Cambodia and one in Thailand, and the field that once stood empty is a lively place now, where 6 homes have been built and hundreds of kids run around doing what children were meant to be doing — being happy. Hopefully there will be dreamers from that harvest field and the work will go on. Tomorrow I will tell you about 30 minutes that changed my life — how I met a young lady from Thailand named Faa. Four months after my first trip to Cambodia, I was back there again, this time with my oldest daughter, Carolina. Again, I had no clue what I was supposed to do. It would still be a few years until I found my sweet spot. For now, I was content teaching university students at Norton University, visiting with kids from homes sponsored by Asia’s Hope, and mentoring young college students who were living in “student centers” in the city. These students were from very poor villages in the countryside and would otherwise not have had a chance to go to school. I worked hard to find sponsors for some of them in the U.S. and spent every night of the two-week period in Cambodia living life with them. Spending time with them ranks among some of the funnest things I’ve done anytime anywhere. They taught me so much about living with little and overcoming tragedies. Though they were the students, I was doing most of the learning and I loved it. I also found ways to help the children. My son’s third grade class, for example, raised $75 and I was able to throw a little party to the Asia’s Hope kids, including giving them a package with some much needed items for their daily life, like a towel and a new outfit. It was exciting presenting the gifts on behalf of my son’s class, but I knew that was not enough. Somehow I couldn’t forget the children at the State-run orphanage. I had to find a way to help them. And you could say it was almost by accident that I stumbled into it. The days were tedious and hot and my hair was unbearably long. I decided to get a hair cut. Walking on the street where our hotel was located, I found a barbershop. The owner was an older guy who looked like a close relative of Confucius. He told me a tale that was too hard to pass. He was a poor barber living in the countryside but his lucky day came one day when the King, who was spending time with his para amour, felt the urge to get a hair cut. The lady happened to live in the same village as the barber. He was immediately ordered to get his tools and get inside the armored car parked in front of his hut. To his shock, before he knew it, he was in front of “His majesty, The King of Cambodia.” And from then on he became the King’s barber. And, of course, in order to keep the King’s “secret,” the King had to keep him close by, so he brought him to Phnom Penh, the Capital city, and gave him a shop on one of the busiest streets of this growing city. And that’s where I met this man. But the best part of his story was not the King, his mistress, or the free shop he got — it was the price of a hair cut, complete with neck and shoulder massage at the end. Only about $3 dollars. I couldn’t believe it. I was paying $20 plus tip for a haircut in California at that time. I decided to let my hair grow and only have a haircut once a year — in Cambodia, with my new barber friend. And here is the “bestest” part — with the money I saved, I was able to throw a party to all 15o kids plus staff at the orphanage, complete with cake, coke, and a gift package. The kids were happy and I was beside myself with my new $3 dollar haircut. I started doing that every year, but that was just the beginning. Tomorrow I will tell you about a field of dreams. Never have I been angrier than that day in Phnom Penh, Cambodia. The year was 2002 and I was making my first trip there, exploring the work a friend had started there among destitute children. Actually, I had no business being there, as my work at the time didn’t require that I leave the country. I went because I had a persuasive friend who would not take NO for an answer. As I walked further into the belly of the building, I came across a whole wing where small babies were kept. 25 of them, all lying on mats on the floor, either inside the room or along the corridors. The smell of urine was strong, the babies were crying, coughing, wheezing, or simply sat or lied quietly, waiting for the inevitable. Some were emaciated and had the look of being already gone. I understood for the first time the expression “walking among the living dead.” Some of those children, even if they were not aware of it, were simply waiting to die. There was no audible answer, but I got a clear impression in my heart. I never got that boy’s name and never knew the end of his story, though I can guess what it was, but that little boy woke up the fighter in me. I told myself right then and there that from that time forward I would do everything I could to get into the fight to rescue at-risk children. I didn’t know what, how, or when I was going to do it, I just knew something for sure: I would not rest until I had made a difference in the lives of children like these. I was doomed for good and I was glad for it. Tomorrow I will tell you about what my first baby steps toward helping children in SE Asia looked like. Please come back.